I was requested to post a windshield repair disclaimer for my auto glass repair service. Due to the process of using pressure and vacuum cycles to repair laminated auto glass and the unstable properties of already broken glass, the damaged area may develop additional cracks or existing cracks may increase in length. 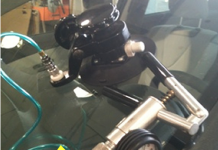 These problems are very rare and occur in less than .1% of all windshield repairs performed. In the unlikely event that we cannot repair the damage to your satisfaction or the damage grows in length either during the repair process or anytime following the completion of the repair, Auto Glass Jim‘s liability is limited to a refund of any amount charged for the attempted repair. Customers agree to pay in full at the time service is rendered unless prior arrangements have been made with Auto Glass Jim. Do you need to have a windshield chip repair but don’t have the time to take it to a shop? 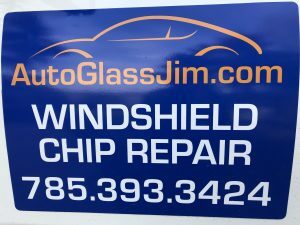 I offer a mobile windshield chip repair service to repair your car’s windshield chip at home or work for only $50. If you have a chip in your windshield and you’re in the Lawrence, KS. area, give me a call so we can take care of your chip before it spreads. I’ve decided to start collecting before and after images of some of my repairs. Maybe you’ll see one that looks like yours and you can get an idea of what to expect. All chip repairs are different and depending on the type of break and severity of the impact some repairs will be almost totally invisible, but others will show only minor improvement in appearance. Visibly, the repaired area will look better (by 50 to 85%). Of course the main reason to repair a windshield is to save the cost of replacing the windshield, and to make it look better. Because all repairs are different some turn out visibly better than others. Visit this page for images of chip repairs.